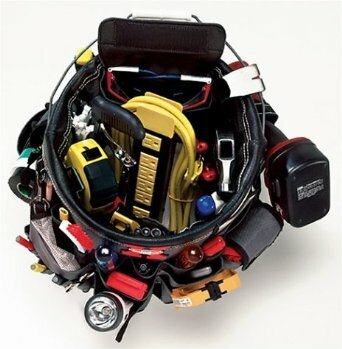 Tool organizers are the single most popular bucket accessory out there. 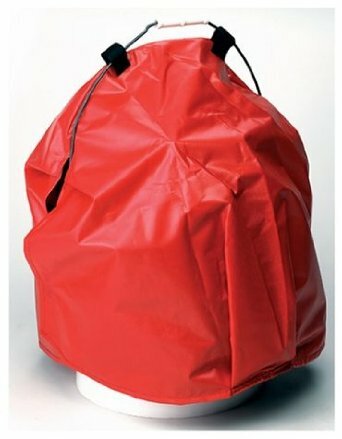 These versatile utility covers slip onto a 5 gallon bucket similar to how you would put on a very large tool belt or tool vest. In fact tool organizers are so popular that you can get ones specifically designed for the types of tools you’re holding – whether you’re a contractor, gardener, or even a seamstress! These are just a few of the specific bucket tool organizers available right now. Or keep scrolling down to read about our toolbox buckets and how we like to use them around the work site. This is a high end tool organizer. Just look how much stuff you can jam into a bucket when you’re using one of these. They’re quite rightly called the Bucket Boss Extreme Fatback. What I like best about this organizer is that they come with a little orange rain jacket that makes sure your tools stay dry if you’re worried about them getting wet out on the work site or in your pickup. You can find the Bucket Boss Extreme on sale at Amazon.com. 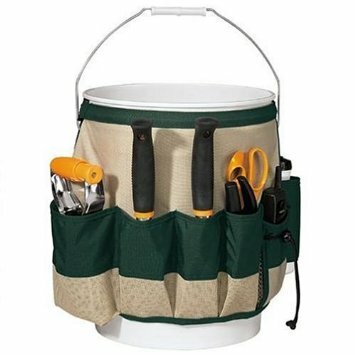 This is the most popular bucket tool organizer in the world right now! Made by the scissors company Fiskars, it’s a much more stripped down version of the Bucket Boss – with a much more stripped down price tag. For most people, a tool organizer like this is more than enough. The Fiskars garden bucket organizer is very similar to the bucket toolbox we use, which you can learn more about below. At the time of this writing, it’s available on Amazon for less than 10$! 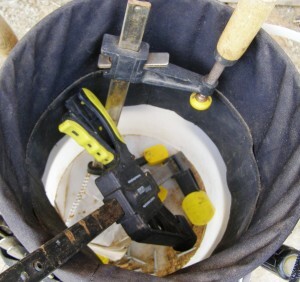 Instead of fastening onto the outside of a 5 gallon bucket like the organizers above, these Bucket Stackers slip inside a bucket and hold much smaller tools like drill bits, nails, and bolts. 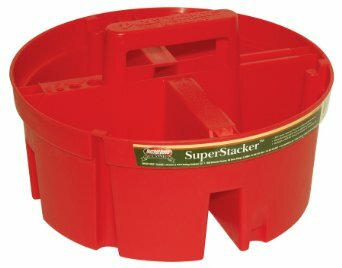 And I know what you’re thinking – can I use the bucket stacker and a bucket tool organizer at the same time? Usually! You just have to make sure that the tool organizer you get isn’t full of pockets on the inside so you can leave enough room for the bucket stacker to fit. 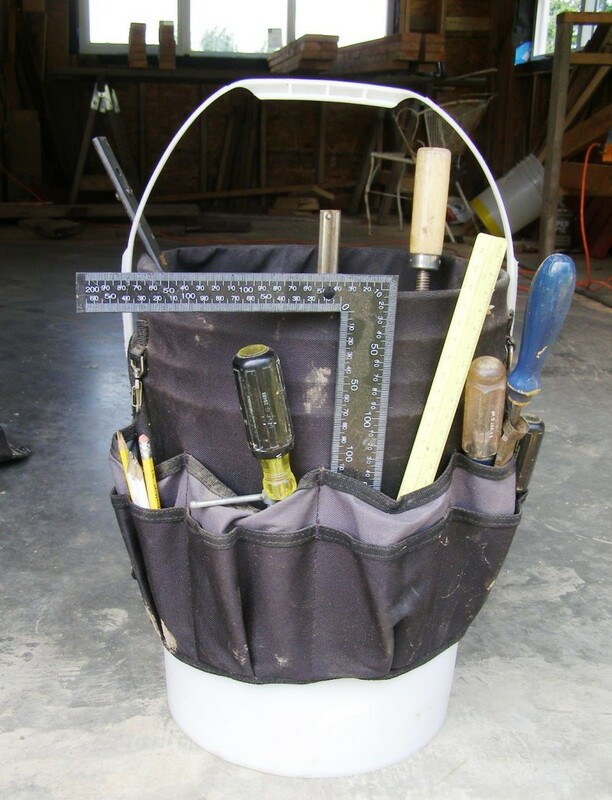 This is our 5 gallon bucket tool organizer, which you can see we use a lot already. We’ve stuffed almost all the outside pockets with tools already, but we’ve still got plenty of room inside for our larger tools. Our tool organizer is a basic model which we bought for around 10$ from a local hardware store. It’s similar to the Fiskars garden caddy above, but isn’t quite as well made. But it serves our purposes just fine. We’ve always used 5 gallon buckets to store tools in, but the tools just end up getting all jumbled together, with things like nails and screws drifting toward the bottom where they’re really hard to get out and use. And what a nightmare it was to find tiny screwdriver bits in amongst all that clutter! Since this organizer doesn’t have its own miniature poncho like the Bucket Boss Extreme featured above, we have to remember to keep it inside when we’re not using it so the tools don’t get ruined by the rainforest climate out here. The projects we’re working on these days require huge powerful clamps, and we can fit a ton of them in the middle portion of the bucket. Right now most of them are off on other jobs but you can see a few here resting until they’re needed again. I have heard of people adding a bucket dolly to the bottom of a bucket toolbox and leading their bucket around the work site like a little dog. We’re working on a 3 story building right now and we’ve actually found that tying a rope onto the handle and hoisting the bucket up behind us when we need something is a great way to fetch a tool without having to climb all the way back down – and that’s not something you can easily do with a normal toolbox either! As an added bonus, this is a tool organizer for a completely different sort of tool – sewing supplies. 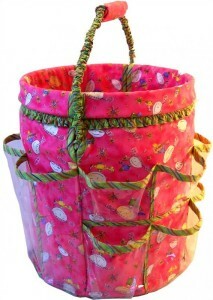 This pink frilly bucket from Buckets Gone Wild is much more appropriate for keeping rolls of cloth, yarn, sewing kits, extra needles or quilting supplies. Do you have a dolly that can be used for 5 gallon bucket’s to wheel the bucket around?